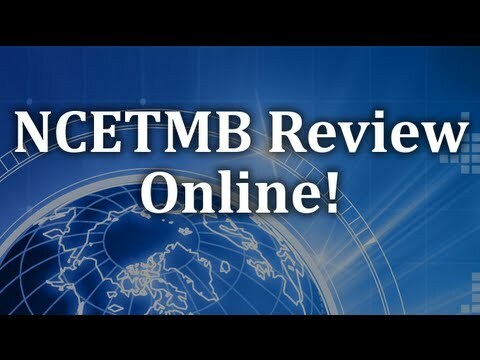 The National Certification Board for Therapeutic Massage and Bodywork (NCBTMB) offers the National Certification Examination for Therapeutic Massage & Bodywork (NCETMB) for national certification purposes. If a candidate does not have all of these, he or she may do a Portfolio Review instead. This computer-based NCETMB test has 160 multiple-choice items. Candidates get 2 hours and 40 minutes to finish. Afterwards, the pass or fail result will be provided. After a successful attempt, a candidate’s certification will be valid for four years, during which time he or she may use the acronym NCETM after his or her name for professional purposes. Candidates will also get a certificate. If unsuccessful, the candidate will receive information about the areas that presented problems so that the candidate can be more prepared if taking the test again. If a candidate is unsuccessful on three tries, he or she will need to wait three months and turn in a new application before trying again. What are the three steps to take for a primary survey when faced with an individual who may not be breathing? Which of the following refers to a passive joint movement? What type of exercise would you recommend to a client in need of improving their breathing? Which of the following is a bony landmark characterized by its large, round projection? How many pairs of cranial nerves are in the human body? A: Airway, Breathing, Circulation are the ABCs of First Aid. This is considered the primary survey and should be conducted immediately after finding a victim. If the individual is in any immediate danger, First Aid protocol states that you address any problem and then move on a secondary survey or assessment. The secondary survey will be more thorough and will include a full body survey to search for any injuries. It is important that both the primary and the secondary surveys are completed and are efficient as these precautions could be life-saving as the victim waits for emergency medical help. B: Passive joint movements also referred to as arthrokinematic movement occur as a result of another movement. This type of passive movement could also be considered the “play” a joint has or its ability to move freely within the joint capsule. Typically resulting after active movements, this accessory movement may slide, roll, or spin within a joint. On the other hand, active joint movements, or osteokinematic movements are voluntary and require effort to perform. For example flexing the arm is considered an osteokinematic movement. In massage, the therapist may perform various movements through stretching. C: Qi Gong is an oriental form of exercise that focuses on the breath. With these exercises, the individual practices the regulation of the breath, or Qi, through meditations and body positioning. These body positions are often performed as slow, deliberate movements and in some forms of Qi Gong, little or no movement is necessary. The purpose of this exercise is to increase the life force through the efficient circulation of the breath. This practice would be beneficial for both clients and massage therapists. Other oriental exercises including Dao Yin, Tai Ji Quan, and Tai Kwan Doe are also beneficial for maintaining balance between the mind, body, and spirit. B: A tuberosity is a bony landmark characterized by its large round projection. Massage therapists may use these bony landmarks to find muscles as the massage. Other bony landmarks include tubercles, which are small and knob-like, and the trochanter, which is found on the femur. Other landmarks such as a crest (ridge or bone, found on the ilium), line (less prominent than a crest, on the femur), epicondyle (raised area), spine (sharp projections), malleolus (projections which are both medial and lateral such as the ankle bones), and a process (prominent projections on a bone) can also be used to locate muscles and their attachments. C: There are twelve pairs of cranial nerves in the human body. Eleven of these nerves originate under the brain’s surface and travel down through the brain stem and spinal cord. However, the one exception is one pair of cranial nerves that begins in the cerebrum. As the cranial nerves travel through the spinal cord, they branch off from one of thirty-one segments in the spinal cord to various parts of the head, neck, and body. Moving from top to bottom, sections of the spinal cord branch off, allowing the nerves to reach the body, including the conus medullaris, filum terminale, and the cauda equine. 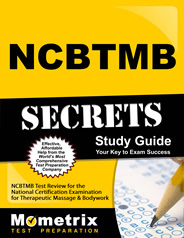 Ace the NCBTMB - NCETMB test using our NCBTMB - NCETMB exam study guide with practice questions. 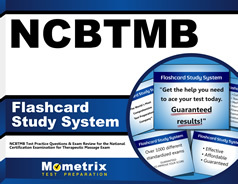 Quickly Solve Difficult NCBTMB - NCETMB Test Questions with the NCBTMB - NCETMB Flashcard Study System.